related portals: Odes of Pindar. 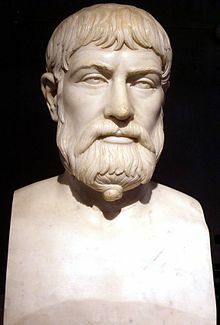 Considered the greatest of the nine canonical Greek lyric poets. Only his Victory Odes (Epinicia) survive intact; his other works exist solely as fragments and quotations. See Portal:Odes of Pindar for odes listed individually. "Biographical Sketch of Pindar", by C. A. Wheelwright, in Pindar and Anacreon, 1846. "Pindar", Chapter XV. in History of the Literature of Ancient Greece, to the period of Isocrates, by K. O. Müller, translated by George Cornewall Lewis, 1847. “Pindarus 1.”, by William Smith in Dictionary of Greek and Roman Biography and Mythology, 1870. "Pindar", a paper by Classicist R. C. Jebb, 1882.